Dubai, UAE, March 15, 2017: Kids across the region will soon be getting their beach groove on thanks to the fashionable and fun COÉGA Sunwear SS17 swim collections which are now available in distinctive GIRLS/BOYS and YOUTH collections. 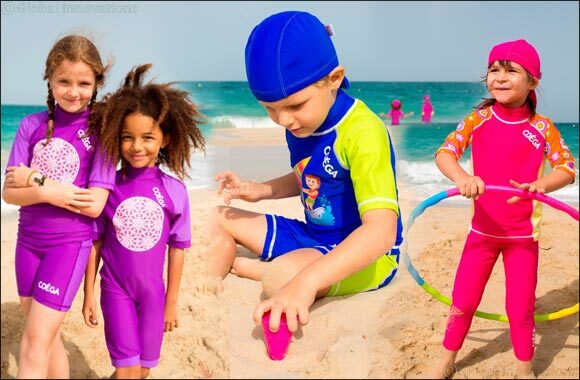 Available in a variety of colourful styles and designs, the collections include bright beach-themed one and two-piece's, long and short-sleeved rashguards, ¾ and full-length leggings and swim shorts and board shorts for boys. The COÉGA GIRLS/BOYS and YOUTH collections are all constructed using superior UV50 swim fabrics and designed for children aged between 0-6 years (GIRLS/BOYS) and for boys aged between 8-12 years (YOUTH) and girls aged between 8-14 years (YOUTH). COÉGA Sunwear is available at: GO Sport Villagio Mall, GO Sport City Center Doha and GO Sport Doha Festival City and Sun & Sand Sports in Dar al Salam Mall, Sun & Sand Sports in Doha City Center, Sun & Sand Kids in Doha Festival City and Sun & Sand Sports in Mall of Qatar. COÉGA Sunwear is also available On-Line at: mumzworld.com, sprii.ae, sssport.com and sanddollardubai.com.